How the CIA Invented and Weaponized the Term "Conspiracy Theory"
This is a straw man and an ad hominem fallacy. Not all conspiracy theorists believe in the same things, nor does believing in aliens invalidate their arguments on other theories. The only thing linking these things is that they are all perceived to be conspiracy theories. Each should be evaluated on its own merits. However, if a theorist bases their beliefs on poor argumentation, then other conspiracy theorists may want to distance themselves from him/her or question that theorist's ability to support their own ideas. 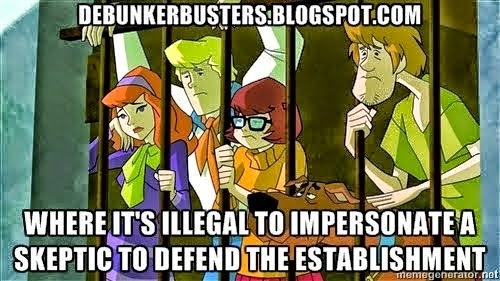 Many such people are accused of being deliberately planted to discredit other theories, a technique called the 'poisoned well'. The media then proceeds to discredit an entire investigative movement based on a few silly theories - a strawman attack. When the media lumps anybody who doesn't trust the government version of 9-11 into the category of flat earthers and holocaust deniers, any real conspiracy there might have been is given the ultimate defense. Namely, a pre-emptive, universal ad hominem on anyone who would dare talk about it publicly, the archetypal 'tin foil hatter'. When it comes to disinformation and pushing official propaganda 'Skeptic' Michael Shermer is perhaps one of the best known talking heads in the mainstream media. With his use of trick arguments, often delivered as sweeping and false generalisations, including blanket denials that are made by appealing (wrongly) to an argument from authority, it sure looks as if Shermer is behaving as an experimental psychologist (his PhD). All too often Shermer's debating influence rests on misrepresentation or psychological/superficial means rather than through sound reason and verified fact. 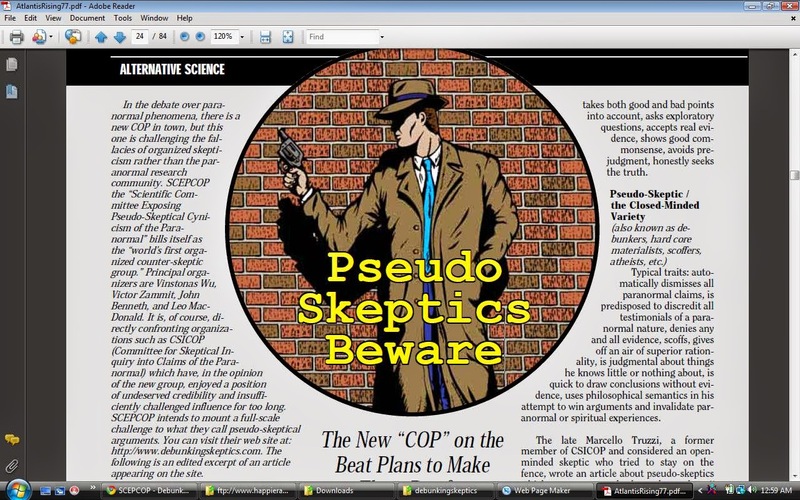 This short expose will show where two separate researchers identified key problems with Michael Shermer’s arguments showing that Shermer mischaracterises 911 truth arguments, that he does not apply scientific principles, and that he muddles specific issues with all manner of conjecture and other matters not directly related to the specific questions raised by the data. Shermer claims he follows the scientific method, but this is false. The second critic of Shermer's listed here, Professor Anthony Hall, pointed out that Dr Shermer’s disinformation operates in large part through ‘guilt by association’ tactics (along with straw men arguments) and characterises this operation as a media performance, in which he (Shermer) peddles generalised or misrepresented dismissals of evidence, claiming academic rigor while obviously not practicing it. Indeed, Shermer's tarring of 911 critics with the brush of mental illness, when appealing to a mass audience, can fool many people, but to a rational mind this is clearly a method of distraction away from dealing with the hard facts, which he misrepresents. Data or arguments are either substantiated or unsubstantiated - the state of one's mental health has no bearing when you are looking at specific details in science. The mistaken belief that a handful of unexplained anomalies can undermine a well-established theory lies at the heart of all conspiratorial thinking (as well as creationism, Holocaust denial and the various crank theories of physics). All the "evidence" for a 9/11 conspiracy falls under the rubric of this fallacy. All the 9/11 conspiracy claims are this easily refuted. There are several errors in Shermer's assertion that "a handful of unexplained anomalies" cannot "undermine a well-established theory". 1. A single anomaly can undermine a well-established theory, as illustrated by the success of a single anomaly -- the Michelson-Morley experiment -- in overturning the well-established theory of ether. 2. The unexplained anomalies of the official story are better described as a mountain than a handful. 3. The official story is not well established in any scientific or legal sense, but only in the sense of being endorsed by corrupt government bodies, such as the 9/11 Commission, and unquestioningly embraced by nearly all media. Such notions are easily refuted by noting that scientific theories are not built on single facts alone but on a convergence of evidence assembled from multiple lines of inquiry. No melted steel, no collapsed towers. For example, according to www.911research.wtc7.net, steel melts at a temperature of 2,777 degrees Fahrenheit, but jet fuel burns at only 1,517 degrees F. No melted steel, no collapsed towers. David Ray Griffin's The New Pearl Harbor, which Shermer insults as "conspiratorial codswallop," takes a similar approach. Contrary to the column's implication, Griffin explicitly developed his thesis as a "cumulative argument" (p. Xiv), which he summarizes in terms of 24 different lines of inquiry (pp. 132-34). Shermer's attack could hardly be more hypocritical. He pays lip service to the kind of cumulative argument known as inference to the best explanation, which requires the consideration of all the relevant evidence. But he avoids the vast bodies of evidence cited by skeptics like Griffin, and fails to correctly state even a single one of their arguments. Instead, Shermer embeds mentions of the works of serious skeptics within a tapestry of ludicrous ideas so as to discredit them through guilt-by-association. This approach has nothing to do with science and everything to do with sophistry. We should note that there is ALSO evidence of melted structural steel that rational truth advocates cannot not associate at all with Jet Fuel, but only with the independent demolition of the buildings. Regardless of whether Melted Steel is necessary to bring down the Towers it has been identified in abundance. Shermer and many skeptics have outright denied, or tried (and failed) to explain away the molten steel through the use of false arguments (the jet fuel one) or to portray this as a feature of the post collapse fires. However, melted steel is present and no ordinary fire, even later ones in the rubble pile, can produce this result. This fact further contributes to the cumulative nature of the evidence in favour of the controlled demolition of the Twin Towers (not to mention WTC7). At a later date we find further criticism of Shermer this time from Professor Anthony Hall who outlines the basic nature of his phony arguments in 2010. I was not prepared for the virulence of Shermer’s verbal attacks on the wide array of targets he groups together with his McCarthyesque tactics of guilt by association. Shermer places a tent of his own imagination over a vast array of thinkers who have addressed a broad number of issues. Rather than dealing with individual thinkers as such, or dealing with the specific elements of this or that contention, hypothesis or theory, Shermer simply groups together the targets of his ridicule as an undifferentiated mass of “conspiracy theorists.” For Shermer conspiracy theorists include all those who question the lone gunman theory concerning the assassination of US President John F. Kennedy, those who believe that the US moon landing was a staged event, those who address the possibility that Earth has been visited by creatures from outer space, and those who challenge various aspects of the government interpretation of what happened on 9/11. As he conflates all these issues, Shermer projects multiple power point slides showing images of human brains. These images seemed to me to be calculated to convey the message that mental illness forms the common denominator of those Shermer collectively condemns as crazed conspiracy theorists. Shermer does major violence to the laws of evidence and proof by making vast and unsubstantiated generalizations about so-called conspiracy theorists rather than addressing the diversity of good, bad, or indifferent work done by thousands of investigators exploring scores of circumscribed problems. Shermer’s circus of pseudo-skepticism sets a terrible example for students and junior researchers. They would and should be blocked from advancing up the ladder of professional scholarship if they were to replicate Shermer’s unique brand of materialist evangelization aimed at turning the zeal of his converts against the demonized others. The complex of alleged connections said to link all thinkers with whom Shermer disagrees draws vital intellectual energies away from the tried and true methodology of setting out specific research problems that are narrowly enough defined to be comprehensively addressed with careful reference to relevant academic literature. Shermer adds insult to injury when he indicates that all those addressing subjects that he has decided are closed to further critical examination belong in the same category as Holocaust Deniers. Here Shermer really crosses the line from mere malevolence into outright slander. As I see it this despicable smear tactic, one too frequently deployed in the effort to discredit those calling attention to certain categories of human rights violation, demeans and exploits the horrific legacy of the Nazi efforts to annihilate European Jewry. Such semantic abuses do severe injustice to the sanctity of the memory of a terrible event in history that illustrates the depths of depravity to which human beings are capable of stooping. 1. They mix together real examples of debunked, or highly questionable belief, with the current issue under review, in order to generally slander a particular line of legitimate inquiry. To these 'skeptics' there are no distinctions between the various subjects under examination - everything is the same! It is guilt, or ridicule, by association rather than addressing the specific evidence (or lack thereof) of each case. This is an exercise in presumptive dismissal. It is an unscientific and illogical approach and good observers will realise its use by pseudo skeptics to avoid whole issues as well as providing cover against answering a specific question. 2. In specific arguments the 'skeptics' often claim they are using the scientific method but instead propagate a false analogy or 'explanation' in order to dismiss the argument being made or the evidence cited. Often their false 'scientific' arguments rest on wrong assumptions. They can go into great detail, but when their basic premises are in error, they are not talking about the relevant issue. For example, regarding the jet fuel or office fire argument that contends that the fires didn't need to melt steel but only weaken it in order for the Towers to collapse - this is an example of a false argument designed to cover for the fact that melted steel was actually found. Great detail can be made in explaining how normal fire temperatures cannot melt steel in order to avoid the fact that it was found. The 911 truth argument is simply that there is evidence of large quantities of molten steel found in the rubble pile - that it clearly came from melted beams or columns, that there were pools of melted steel, and large amounts of iron spheres found in the dust. The obvious and logical implication here is that incendiaries must have been involved since office fires and jet fuel could not cause such phenomena. It is apparent that Shermer's overall approach seeks to discourage rational thought (via misplaced ridicule) and to hide or obfuscate key evidence that points to inside involvement in the crime with false arguments. However, by carefully following the Shermer line of argument, and asking if he has adequately addressed the specific points of key evidence (this sometimes requires a bit of research on the part of the observer), anyone can deduce whether what is being put forward is credible - especially when it comes to basic points like melted steel or the freefall collapse rate of WTC7 (not to mention the recorded sounds of explosions and the witness testimony to these events). Any rational witness to intrinsically false arguments, such as the ones advocated by Shermer, will almost always be able to recognise them. This leads us to suppose that Michael Shermer, who is obviously not unintelligent, more than likely realises the bankruptcy of his own arguments and is, as the critics above suggest, an agent of disinformation. More Debunking the Debunkers blog posts relating to Shermer. In this video, I debunk Potholer's junk science video he made in response to my previous video debunking another of his junk science videos. Tony's made a number of straightforward observations here that highlight the errors in the AGW position pushed by Potholer. See video - whether we are talking about the Northern or Southern Hemisphere the global warming advocates predict significant rises in temperature for each 100ppm rise or fall of CO2. This is not borne out in reality. In regards to the academic papers being cited, Tony points to the problems with the papers whereas it seems Potholer often uses material uncritically. This is a big problem for AGW proponents because we KNOW the data in many instances have been altered to suit the warming hypothesis. What must happen is an argument should be made as to why the problematic papers are still sound. Astrophysicist Joseph Postma Debunks Mainstream Global Warming / Climate Change Narrative forever based on the climate science math and alternative greenhouse effect climate scientists use themselves.